Tottenham manager Mauricio Pochettino has insisted that his side should not be considered as realistic contenders for silverware this season. Spurs initially made a blistering start to the new Premier League campaign, securing successive wins against Newcastle United, Fulham and Manchester United in their opening fixtures. However, two consecutive defeats since their win at Old Trafford has dampened the mood at the club, particularly given the nature of their performances during those losses. Firstly against Watford, they were out-battled in midfield and physically inferior to their opposition and secondly against league leaders Liverpool, they failed to keep the Reds at bay throughout the contest and were ultimately lucky not to be on the receiving end of a thrashing. 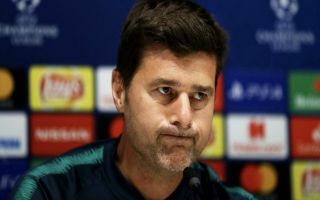 According to Football London, Pochettino has clearly been deeply affected by both results and he voiced his doubts about his team’s trophy-winning credentials in today’s club press conference, admitting to reporters: “I don’t think we’re realistic contenders in any single competition. “That is my view. If we show the same face we did against Watford, so difficult. “If we show the same face as Liverpool, so difficult. If we show the face from some bits of Old Trafford, then maybe yes. The Argentine coach was speaking ahead of Tottenham’s first Champions League encounter of the 2018-19 season on Tuesday, as they are scheduled to face Inter Milan at the San Siro. The Lily Whites have been drawn in a nightmare group alongside the Italians, Barcelona and PSV Eindhoven, but supporters will take solace in the fact that the team negotiated their way through a similarly difficult group at this stage last term, beating Real Madrid and Borussia Dortmund along the way. After their European exploits Spurs will travel to Brighton on Saturday for their next Premier League game, which is a must win for the club if they are to keep in sight of the early leaders in the table.